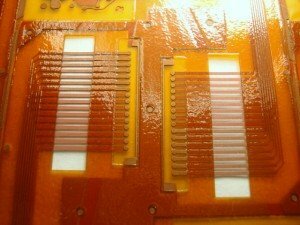 Coverlay or “coverfilm” is used to encapsulate and protect PFC external circuitry to withstand extreme temperature, vibration and other harsh environments. Its purpose is the same as solder mask to rigid PCBs. Kapton® and other polyimide films in aircraft insulation and cabling as it can withstand temperatures from –269°C to 400°C. Photovoltaics use similar films for silicon modules and CIGS applications due to CTE, moisture, and electrical performances. Bondplys, coverlays, and similar adhesive systems are used in the medical industry involving permanent implantation, device packaging, and medical equipment. Prior to coverlays being aligned and laminated on production panels, MLT can laser drill or rout the coverlay for the component feature openings. 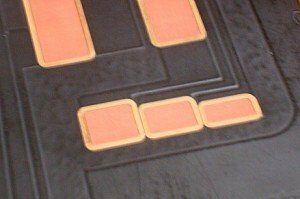 For post coverlay lamination, laser skiving processes are used remove the coverlay to expose underlying circuitry or pads. Coverlay skiving is used to form openings smaller than mechanical drilling or routing or openings too small to accurately align during lamination. 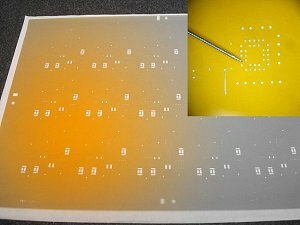 Other typical applications include ‘window’ skiving of floating contacts (fingers) prior to tin, solder, or plating. DuPont™ Kapton® FPC-MBC black polyimide coverlay laser processes with the same precision as other polyimide films or coverlays. The matte black polyimide film can be conductive and can prevent reverse engineering of the circuit designs it covers. MLT has processed all varieties of coverfilm from DuPont, Hitachi, and Sheldahl to name a few. To request a quote or discuss application details, contact our sales staff .